Though it does not pre-assign seats or provide onboard meals and at times has a lengthy wait and check in process, consumers year in and year out rank Southwest Airlines at the top or near the top of customer service. Why is Southwest consistently near the top? There are many reasons. The most significant being alignment of customer experience to both their brand and customer expectations; however, I believe a key component of Southwest success in customer service is the emotional intelligence of their employees. A master of fear and anxiety and the ability to tap into selfless motives. Leading customer experience brands position the employee to constructively respond to challenges, make decisions in the moment, empathize with customers, and perhaps most important, not only feel but express feeling of care, concern and empathy to customers. Much of the benefit of emotional intelligence is derived in “moments of truth” where some experiences in the customer journey have far greater importance than others. These moments of truth represent increased risk and opportunity to leave a lasting emotional impression on the customer; a lasting impression with significant long-term implications for both customer loyalty and wallet share. Perhaps the most common moment of truth is when something has gone wrong, the customer is unhappy or scared, and the relationship is at risk. How do we build emotional intelligence? First of all, emotional bonding cannot be scripted. Attempting to script such a connection will inevitably come off as hollow and insincere lacking authenticity and empathy, completely undermining the desired customer experience. Rather, emotional bonding must be a result of a spontaneous series of events that emerge from the emotional intelligence of employees. The obvious starting point in building emotional intelligence is hiring frontline employees with the requisite emotional intelligence skills. Emotional intelligence can also be learned. However, it is a “soft” skill, unlike “hard” skills such as math; it can’t be taught in structured sessions. Rather, emotional intelligence is learned like almost all other human behaviors primarily though observation, experience and imitation. Give people meaning in their work: Inspire frontline employees with a purpose beyond a paycheck. This clarity of purpose should include both what they are supposed to do and why they are supposed to do it. In empowering frontline employees to serve customers, brands should arm them with statements of general principles and values rather than scripted procedures, which undermine empowerment. 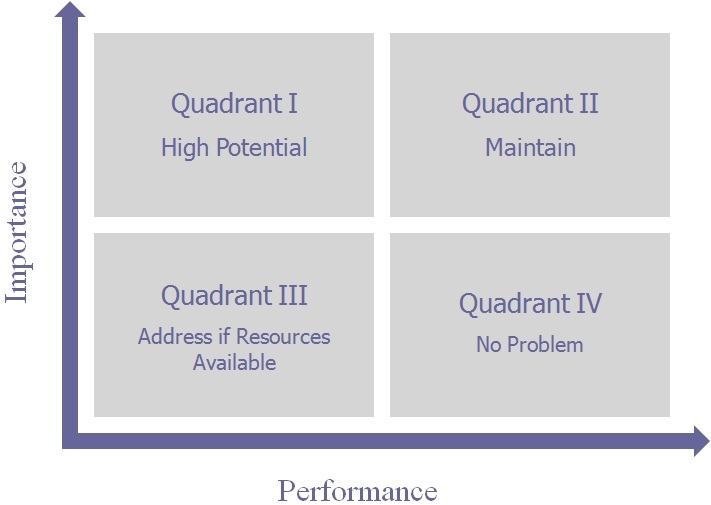 Reinforce these principals often so in the instant, when they are in a moment of truth with a customer in need, they have an appropriate framework from which to resolve the issue – and bond the customer to the brand. Most frontline employees want to help customers; however, their motivations may be varied. Leading customer experience brands allow their employees to discover their own motivations for looking out for the customer’s best interests. Create learning opportunities through experience: Humans are programmed to learn through self-discovery. Self-discovery reinforces the learning process by instilling a sense of accomplishment or pride. These positive feelings associated with self-discovery are a strong psychological reward, which reinforces the learning process. While self-discovery is not a top-down process, managers can foster self-discovery through feedback, encouraging employees to reflect on their own successes and failures, and anecdotes about other employees. Case studies are not just for MBA students. Align customer experience systems and processes: It is imperative that systems and processes support the emotional skills desired from employees. Systems and process must constantly reinforce the overall message of emotional intelligence and emotionally connecting with customers. In empowering employees to respond to moments of truth, management must strike a balance between financial considerations and the things that matter to the customer. Good customer experiences are not good because they are good; they are good because they are profitable; however, there is no benefit to being penny wise and pound foolish. Finally, processes need to be streamlined to give employees both the time and ability to rise to the situation. Enlist leaders and mentors: Emotions are learned through modeling. Children don’t learn to react to certain stimuli just because a parent tells them what to feel. We learn how to react to certain situations through trial and error and observing role models. First, it is imperative that all managers and leadership model appropriate emotional skills. How can you expect emotional intelligence from the frontline if it doesn’t exist in leadership? Second, identify employees with the appropriate emotional skills and position them as role models within the organization. Key to success of any customer facing brand is alignment of the customer experience to both the brand promise and customer expectations. Most of time, this is not difficult. Appropriate systems procedures and even automated delivery channels can achieve this end. However, in moments of truth, where there is a high degree of risk associated with the outcome of the experience, leading customer experience brands rely on an emotionally intelligent frontline staff to align the experience and bond the customer to the brand. Previously we discussed the concept of “moments of truth” where some experiences in the customer journey have far greater importance than others. These moments of truth represent increased risk and opportunity to leave a lasting emotional impression on the customer; a lasting impression with significant long-term implications for both customer loyalty and wallet share. Perhaps the most common moment of truth is when something has gone wrong, the customer is unhappy or scared and the relationship is at risk. These events could be the result of: service delivery failures (unavailable service, unreasonably slow service, or other core service failures); customer needs and requests (special customer needs or customer preferences); or an adverse outcome (loan denial or loss of investment principal). 2)	arousal (the extent to which the energy mobilization of the emotional state is experienced on a scale of active to passive or aroused to calm). Together, valence and arousal can define all human emotions. States of high arousal and positive valence are excited or happy; low arousal and negative valence are bored or depressed; while states of positive valence and low arousal are calm and relaxed, and negative valence and high arousal are angry or frustrated. Not surprisingly, people are motivated to maintain positive moods, and mitigate negative affective states. People in negative affective states desire choices that have the potential to change or, in particular, improve their moods. For example, researchers have demonstrated a preference for TV shows that held the greatest promise of providing relief from negative affective states. People in a sad mood want to be comforted; anxious people want to feel control and safety. Beyond solving the problem, the objective in dealing with an upset customer is to help relieve their negative affective state. If they are angry, attempt to calm them; if anxious, provide comfort. Time and time again, our research across many brands reveals that beyond resolving their problem as efficiently as possible, what customers want is empathy and reliability. We want to talk to someone who both understands how we feel and is reliable. They both have a solution to the problem and what they say will get done, gets done. Anticipate potential needs for recovery: In designing tools to monitor the customer experience, managers must be aware of potential moments of truth and design tools to monitor these critical points in the customer journey. Some of these tools include: monitoring customer comments from comment cards or online forms to identify instances where the customer is either extremely happy or dissatisfied; monitor social media to identify common causes of moments of truth; survey tracking specifically focusing on the responses from dissatisfied customers; and mystery shopping to test the response to specific problem scenarios. Decentralize decision making & empower front-line employees: In empowering frontline employees to serve customers, brands should arm them with statements of general principles and values rather than scripted procedures, which undermine empowerment. Reinforce these principles often so in the moment, when they are in a moment of truth with a customer in need, they have an appropriate framework from which to resolve the issue – and bond the customer to the brand. Train the frontline: Training the frontline to handle problem resolution requires training not just in decision making, but also emotional intelligence. Can emotional intelligence be taught? Yes, but it requires a unique approach of self-discovery. Self-discovery is not a top-down process, however. Managers can foster it through feedback, encouragement to reflect on their own successes and failures, and anecdotes about other employees. Customers experiencing a problem want to change their negative affective state. When dealing with an upset customer it is incumbent on the frontline to help relieve this negative state. Time and time again, in research study after research study, Kinesis finds that the two service attributes that influence customers in a positive way when they encounter a problem are empathy and reliability. Customers want to interact with employees who understand their feelings and are able to resolve the problem. What if I told you that after all your efforts with marketing (product, positioning and price), there is a one-in-ten chance the branch representatives will undermine the sale? Now more than ever, it is critical for banks to establish themselves as the primary provider of financial services, not only for deposit accounts but across a variety of financial products and services. Increasing the average products per customer will require a strategic approach to both product design and marketing. However, at the end of this strategic marketing process, there is the human element, where prospective customers must interact with bank employees to complete the sales process. As part of our services to our clients, Kinesis tracks purchase intent as a result of in-branch sales presentations. According to our research, 10% of in-branch sales presentations observed by mystery shoppers, result in negative purchase intent. What do these 10% failed sales presentations look like? Now…after all the effort and expense of a strategic cross-sell strategy, which of the above experiences do you want your customers to encounter? Would it be acceptable to you as a marketer to at the end of a strategic marketing campaign, have 10% of the sales presentations undermine its success? As part of any strategic marketing campaign to both bring in new customers as well as increase wallet share of existing customers, it is incumbent on the institution to install appropriate customer experience training, sales and service monitoring, linked with incentives and rewards structures to motivate sales and service behaviors which drive purchase intent. Increasingly banks must operate in a multi-channel environment. While the changing role of the branch, combined with automated channels such as online and mobile, are getting a lot of attention, there remains a key role for the contact center in delivering an effective customer experience. Central to this key role is designing an effective customer experience, comprised of the right sales and service behaviors – those which influence customer attitudes and behaviors in a profitable way yielding the most return on investment. To provide direction with respect to what sales and service behaviors will yield the most return on investment, Kinesis conducted a series of mystery shops to identify which sales and service behaviors have the most influence on purchase intent. In addition to observing specific sales and service behaviors, mystery shoppers were also asked to rate how the call would have influenced their purchase intent if they had been a real customer. This purchase intent rating was then used as means of calculating the strength of the relationship between each behavior and purchase intent. When the percentage of calls in which purchase intent significantly increased is tested against the percentage of calls where purchase intent significantly decreased, nearly all the sales and service attributes are statistically significant at or above a 95% confidence level. The differences between the highest and lowest purchase intent for product knowledge and ease to understanding explanations are the most significant, while a professional greeting is the least significant. The attributes with the most significant differences between high and low purchase intent ratings appear to be those associated with reliability and empathy. It appears mystery shoppers valued such “core” attributes as product knowledge or interest/enthusiasm for the customer. They seem to be less concerned with more peripheral service attributes, such as asking for names, etc. Influencing purchase intent is not as simple as merely using the customer’s name or answering the phone within a short period of time. Rather it is a much more challenging undertaking of being competent in your job and having the customer’s best interests at heart. [i] Significance testing determines if any differences observed are the result of actual differences in the populations measured rather than the result of normal variation. Without getting into too much detail, significance testing produces a test statistic to determine the probability that differences observed are statistically significant. A test statistic above 1.96 equates to a 95% confidence level, which means there is a 95% chance any differences observed are the result of actual differences in the populations measured rather than normal variation. For all practical purposes a test statistic over 3.1 means there is 100% chance the differences observed are statistically significant (although in reality the probability never reaches 100%). Finally, in interpreting the following analysis, it is important note that test statistics are not lineal. A test statistic of two is not twice as significant as a test statistic of one. The influence on significance decreases as the test statistic increases. However, the test statistic does give us an opportunity to rank the service attributes by their statistical significance. This management philosophy is as true today as it was 50 years ago when W. Edwards Deming used it. Mystery shopping is more than a pure measurement technique conducted properly; it is an excellent motivational tool to motivate appropriate sales and service behaviors across all bank delivery channels. Unlike the various customer feedback tools designed to inform managers about how customers feel about the bank, mystery shopping focuses on the behavioral side of the equation, answering the question: are our employees exhibiting appropriate sales and service behaviors? So…what behaviors, channels and employees should be shopped? Sales channels and sales behaviors offer the most ROI relative to other types of shopping. In terms of prioritizing mystery shopping resources, shops of sales channels and sale behaviors should be the first priority. With the increasing use of universal associates and transforming tellers into sellers, it is incumbent on managers to measure and motivate these higher level sales skills, in both branches and contact centers. After sales behaviors have been prioritized, if resources remain for mystery shopping service scenarios can be included in the mix. As for the specific measurements, the best practice for mystery shop design is to focus on empirically measureable employee behaviors captured with objective questions. (Was a specific behavior present or not?…Yes or no). The best methodology for deciding which questions to ask is to start with your brand promise, and determine which sales and service behaviors animate the brand. Once you have developed a list of expected behaviors, the next step is to map each behavior to a specific question. Avoid compound questions which ask about two different behaviors, unless you expect both behaviors to be present at the same time, and you are not worried about distinguishing if one is present without the other. Open-ended questions, either in narrative form or qualitatively asking what shoppers liked or disliked about the experience, add valuable context for understanding the customer experience. Many clients consider these qualitative observations the heart of the shop. While the core of the mystery shop is objective measurements of specific behaviors, there is a place for subjective impressions. Rating scales are used to capture shopper impressions of various dimensions of the customer experience, as well as the overall experience itself. These subjective ratings provide valuable context for interpreting the customer experience, and specifically the efficacy of the objective behaviors measured. For example, purchase intent ratings calculate a correlation between the objective behaviors measured and purchase intent, identifying which behaviors may be more important in terms of driving purchase intent, and which investments in training, incentives and rewards have the most potential for ROI. Finally, given mystery shopping measures employee behaviors against bank service standards, it is a best practice to calibrate and align service standards with customer expectations by constantly feeding information uncovered with the customer surveys back into the service standards and mystery shopping. 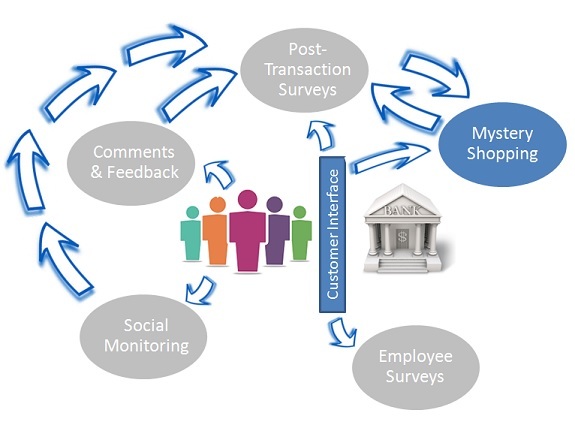 Such an informed feedback loop between customer surveys and mystery shopping will ensure the behaviors measured are aligned with customer expectations.